Business in downtown Redwood City, California, has taken an upward turn on Tuesday nights thanks to the Redwood City Improvement Association, Christie®, Tekamaki and BARTKRESA Design. Previously the quietest night of the week, more than 1,000 people now flock downtown to see the San Mateo County History Museum lit up in a stunning visual display. Influenced by projection mapping projects in America and around the world, Redwood City wanted something to draw people downtown and create a positive economic impact on local businesses. 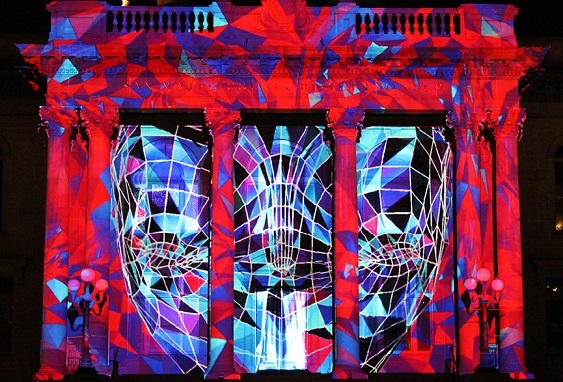 After securing funding to stimulate the downtown Redwood City economy, the idea of doing a projection mapping show became a reality, with the San Mateo County History Museum and Courthouse Square being the obvious choice. “I always wanted to do something really unique in the Courthouse Square; it’s considered Redwood City’s living room,” said Eric Lochtefeld, owner of the Fox Theatre, and President of the Redwood City Improvement Association. Tekamaki worked with BARTKRESA Design to plan, specify, install and manage the entire project including the installation of the two Christie Roadster S+22K-J projectors on a custom-built cart installed in the Fox Theatre across the street. “Bart was calling out specific benchmarks of light levels that he would want to see with his content. So, from that, we designed and selected the gear. We did look at other products, but we were happiest with the Christie,” said Bob Loney, managing partner, Tekamaki. “I was approached by Tekamaki to work with them and we agreed to create a 15-minute show that would bring more people to the town, to the square, to the restaurants. They wanted a very dynamic show driven by music and images but said nothing specific about the subject. That gave us a lot of freedom,” said Kresa. The performance begins with a 5-minute pre-show, a 5-minute video “that is spectacular,” and a 5-minute wind-down. Lochtefeld also requested various screen saver images to play on other nights, creating one still image. “We created a story with part of it showing the history of Redwood City in parallel to the development of the Silicon Valley – from computer processors to the digital creation of life and humans in the future. The architecture gave us a lot of inspiration because we look for ways to transform the building or different ways of expression with the façade,” Kresa continued. With a throw distance of 178 feet, ambient light was a consideration yet Christie J Series easily overcame any concerns about washed out images. However, there were concerns about the museum’s windows. The impact has been immediate: after only a few months, over 1,000 people are viewing the show eachTuesday and spending the evening downtown. BARTKRESA Design is the premiere projection mapping studio that specializes in developing one-of-a-kind projection solutions throughout the world. By combining timeless artistry, industry-leading projectors, and adhering to the highest technical standards, BARTKRESA design develops brilliantly immersive projection environments that give rise to amazing large-scale augmented realities. Our team of San Carlos-based video display professionals applies its passion and creativity to develop and produce everything from trade show booth experiences and corporate meetings to technical support for events and integrations large and small. Clients include Electronic Arts, NASA, Warner Bros., United Technologies and Google.